How many F1 students stay in US? What are the F1 visa work limitations? If you would like to extend your stay and work in the US after graduating on an F1 student visa, it is important that you research your options and plan ahead. In 2019, the US Immigration and Customs Services (USCIS) offer a confusing array of visa options, shifting requirements, eligibility & quotas that often require an immigration lawyer to apply for. Pre-completion OPT before completing academic studies. F-1 students must have been enrolled in school for one full academic year and work only part-time while school is in session. They may work full time when school is not in session. Post-completion OPT after completing academic studies. F-1 students may work part-time (min 20 hours per week) or full-time. All periods of pre-completion F1 visa OPT work will be deducted from the total available 12 months to determine the available post-completion F1 OPT visa status available for the student. OPT application, F1 visa work permit and student work visa guidance is usually handled through your university international student office. Apply for your student work visa early as you don't need to wait for a job offer. Typically post completion OPT students apply 90 days before the last day of your final quarter. You can apply for your F-1 visa work permit as late as 60 days after a program, although late applications are strongly discouraged. USCIS only allows F-1 students to stay unemployed 90 days past their program end date before having to leave the US. 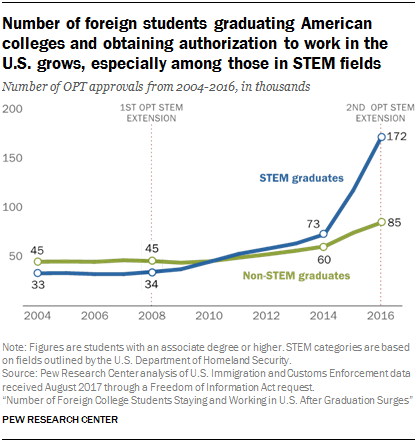 Once an F-1 student is working in a post completion OPT, the STEM OPT extension allows students with certain science, technology, engineering, or math (STEM) degrees to apply for a 24 month F1 visa extension to their OPT authorization bringing the total maximum F-1 OPT visa status period to 36 months. STEM graduates often use the extension time to work with Chudnovsky Law to line up a transition to another visa for longer term employment. USCIS must receive the STEM OPT extension application as early as 90 days before or no later than the end of the OPT period. If your objective is to stay and work in the US after your F1 OPT visa status expires, it is best to use all your US student visa work OPT authorization after you graduate to allow time after graduating for planning and transition. Many visa options outlined below, such as an F-1 to OPT to H-1B can have long lead times and qualifications that require you carefully map out the steps, find employer sponsors and make good use of the limited OPT time you have. Students often elect to pursue additional education or graduate degrees after completing their F1 visa USA undergraduate studies. Students need to work with their international student advisors to timely update their I-20 or DS-2019 to accurately reflect their new school and major and ensure they do not violate their F-1 expiration before transitioning. They have invested, or are actively in the process of investing, a "substantial amount" of capital in a bona fide enterprise in the US. Are seeking to enter the US solely to develop and direct the investment enterprise. This is established by showing at least 50% ownership of the enterprise or possession of operational control through a managerial position or other corporate device. "Substantial amount" of capital definition varies depending on the business plan and needs of the business. Initial period of stay is 2 years with no maximum number of 2 year extensions. EB-5 visa: For non-citizens who invest at least $500,000 in the US in USCIS qualified investments that create US jobs. This visa offers an F1 visa OPT to green card path. Period of stay: Can be permanent as investors and their families are eligible for a green card or permanent residence. This is a rare student visa to green card path. Investments can be made directly or through regional centers and include a wide variety of options including real estate, businesses and restaurants among others. Investments can either be passive or actively managed by the investor. E-3 visa: For Australian nationals coming to the US solely to perform services in a specialty occupation. H-1B visa: For certain specialty skill occupations requiring bachelor's degrees. H1-B visa quota caps are quickly used up within days of release on April 1st of each year. 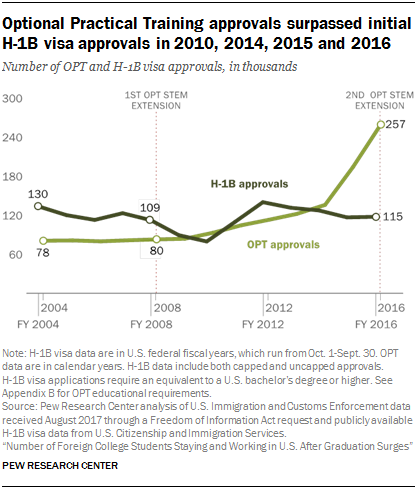 For 2018 Congress mandated a regular cap of 65,000 H1-B visas and a further H1-B Master's Exemption cap of 20,000 visas available for Master's degree or higher applicants. For 2017 USCIS reached the quota on April 7th after receiving 236,000 applications in 5 days for the 85,000 available visas. Cap-Exempt sponsors: Some H1-B sponsors are exempt from the cap including certain (1) higher education institutions, (2) non-profits affiliated with higher education institutions, and (3) nonprofit research or governmental research organizations. Start date: The earliest start date for an April 1st application is October 1st of each year. L-1 visa: For employee transfer of a multi-national company or affiliate, or for establishing a new US office. Employee must be seeking to provide service in an executive or managerial capacity. Employee must have worked for the company for at least one continuous year out of the last three years. O-1 visa: For non-citizens with extraordinary ability in the arts, science, movies, education, business or athletics, intending to engage in official activity in the US. An advisory consultation letter from a qualified peer group is generally required to qualify. E-1 visa: For a Treaty Trading employee to carry on substantial international trade with their home qualifying treaty country. Example trade items include: goods, services, international banking, insurance, transportation, tourism, technology and its transfer, and some news-gathering activities. Initial period of stay is 2 years with unlimited 2 year extensions. TN visa: For qualified Canadian and Mexican citizens engaging in NAFTA authorized professional business activities in the US. Immigrant work visas are for foreigners seeking legal permanent residence and possibly US citizenship. Foreigners applying for an immigrant work visa usually need a U.S.-based sponsor approved by the USCIS (U.S. Citizenship and Immigration Services). EB-1 visa: For non-US citizens who are exceptional professors and researchers. EB-2 visa: For non-US citizen professionals with advanced degrees (or their equivalent) and who have an exceptional ability in arts, sciences, or business that benefit the United States economy, cultural or educational interests, or welfare. EB-3 visa: For non-US citizens who are skilled workers or professionals. EB-4 visa: For non-US citizens who are broadcast professionals, religious workers, armed force members, or Afghan and Iraqi translators, among others. EB-2, EB-3 and EB-4 immigrant work visas require a Permanent Labor Certification from the Department of Labor (DOL) certifying to the USCIS that there are not sufficient U.S. workers able, willing, qualified and available to accept the job opportunity in the area of intended employment and that employment of the foreign worker will not adversely affect the wages and working conditions of similarly employed US workers. For an F1 student marrying a US citizen, you may not be eligible for US citizenship immediately, but you become eligible for transitioning from an F1 visa to green card directly. And there are no limits or waiting periods for spousal green cards. A green card can then lead to citizenship. It is important to note that, even though you are married to a US citizen, you will have to fulfill certain criteria before you can be granted a green card. It is very important that you not be found “inadmissible” by breaking immigration laws or committing crimes. You will be eligible to apply for US citizenship three years after obtaining a green card. In order to qualify for citizenship you will need to demonstrate good moral character, be able to speak, read, and write English, and pass a US civics test. Typically you will be interviewed by USCIS and tested on your knowledge of civics and the English language. Can F1 students apply for green card directly? The green card lottery, or "Diversity Immigrant Visa Program" is a path from F1 to green card directly that makes up to 50,000 immigrant visas available annually, drawn by random selection among all entries to individuals who are from countries with low rates of immigration to the United States. Most lottery winners are from outside the US and immigrate through consular processing and issuance of an immigrant visa. This program is offered for free by the US State Department during a registration period that usually begins in October of each year and ends in early November. What is the F1 visa grace period after graduation? And after OPT expires? The F1 visa grace period after graduation is 60 days after completion of your full course of study and any additional period of authorized optional practical training. It is important to legally maintain your visa status when studying in the US. After you complete the full course of study and after OPT expires, F1 visa rules provide a 60 day F1 grace period to leave the United States. Transfer to another education institution. Change your education level, for example from a bachelor degree to masters. Overstaying F-1 visas means you are no longer in a valid immigration status. Under F1 visa rules, if you are in the US and you have overstayed an F-1 student visa, your best option is usually to return to your home country as soon as possible. When you are not in a valid immigration status, you are usually not able to apply for a change of status inside the US. You would need to go through consular processing in your home country for a new visa in order to remove the overstay issue. If you continue to stay in the US out of status, you can begin to accrue "unlawful presence" which can make you inadmissible to the US and barred from reentering the country. For F1visa students admitted for duration of stay, unlawful presence usually doesn't begin until the government makes a formal determination you are here unlawfully. Often these determinations are made when a student applies for a change of status after overstaying their visa. The consequences of unlawful presence are substantial. For example, 180 days of unlawful presence can result in a finding of inadmissibility to the US and a ban on reentry for 3 years. A year or more of unlawful presence can cause a 10 year ban on reentry. Consulting an experienced immigration attorney is advisable to evaluate your options after accruing unlawful presence. Can international students work in the US after graduation? Many of these options have extensive lead times and complex qualification criteria that require careful planning and finding employer sponsors. To maximize the odds of success, it is advisable for students to save their OPT time to work after graduation and figure out their preferred path at least 12 months before graduation. That provides at least 24 months (36 months if STEM) to work out the steps, sponsors and requirements. How many international students stay in the US after graduation? What are the F1 visa work rules? Any off-campus employment must be related to the F1 student's area of study and must be authorized prior to starting any work by the Designated School Official and USCIS. What's the difference between USCIS, BCIS and INS? The short answer is they are slightly different versions of the same organizations that have existed over time. The United States has many agencies processing and monitoring immigrants and arrivals to the US. The US Immigration and Naturalization Service (INS) oversaw US immigration between 1933 and 2003. The Bureau of Citizenship and Immigration Services, or BCIS, was a successor agency created after INS was dissolved following the 9/11 attacks. Although soon after BCIS was established, it was renamed the organization most know today, the US Citizenship and Immigrations Services (USCIS). Most non-US citizens work primarily with USCIS for their immigration matters and visas. When checking BCIS case status, students must now use the USCIS case status website since BCIS no longer exists. Our experienced lawyers can help create a solution based on your unique situation and goals. Tsion Chudnovsky is an immigrant to the US and founder of Chudnovsky Law, a California law firm that helps international students immigrate to and/or work in the US after graduation and review F1 visa to green card permanent residence options. The firm offers a rare team of skilled multi-lingual immigration and business lawyers and international student criminal defense, DUI defense and injury attorneys. Chudnovsky Law represents students and U.S. immigration clients throughout the world. You can connect with Tsion on LinkedIn, Google+ and Facebook. This information does not constitute legal advice and is not a substitute for individual case consultation. No representations are made as to the accuracy of this information and appropriate legal counsel should be consulted before taking any actions.